This map should now have a description and a more appropriate icon. This map should now have only 1 medium gold mine per player, but also have a second large gold mine and unowned settlement per player, making the map be more balanced for the atlanteans. Unlike MapGen, RMS Creator 2.0.1 beta allows you to place objects within a certain radius of each player's spawn area, so you can, for example, put chickens and/or berry bushes, medium gold mine(s), and trees close to every starting town center, which I did. This RMS is intended to be a regular version of ensemble's erebus RMS, except that all of the land is in a huge, thin ring, and everything else is lava, and theres more or less objects on the map, and there are also chickens and such near starting TCs so that the AI won't bug out. This map should work with between 2 and 12 players, but its very thin with 2 players, and not so much with 12 players. Please inform me via this map's comment section if something is wrong with this map that is not already listed below. Do NOT contact me by e-mail; I used a temporary address. 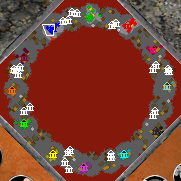 Ring of Fire.RMP is the file that I used in RMS Creator 2.0.1 beta to create this map; you can just delete that file if you want, or you can download RMS Creator 2.0.1 at the below link and load it up to edit it! Big thanks to Hermes_D for making that program. Meh... Firstly, extreme lack of resources. This 11 ugly chicken- just enough for advancing, and then you need to farm, farm, farm, again farm, thousand more times farm. I understand that it`s nowhere to insert deers or elks, but at least it should be something more to eat. Secondly, lack of space. I had extreme difficulties while moving peasants. IT IRRITATES! Sorry, but need to do something with that. Also, I would recommend using more apropriate icon. Additional comments: Very tough anyway, I liked it! Maybe some updates? Well, maybe I could increase the number of boars and increase the 24 circle sizes from .014 to .015, but I don't want the circle to be too wide for 12 players. Also, there are boars some distance from the player starting areas, in the places where you can also find relics, settlements, large gold mines, and shades and serpents. I guess that I could add some more boars to it, but I don't wanna have 2 large gold mines and settlements per player cause its not gonna place them so fairly with alot of players; heres how the game would place em if I used 3 settlements and large gold mines per player with 12 players. I'll update it in some minutes to have 3 boar clusters per player instead of 2, an extra average boar per cluster, and to decrease the maximum distance from the player starting areas that they can be at from 200 to 120, and to similarly decrease the maximum distance for serpents and shades, and to increase the width of the ring by ~14.3%. Bah, I can only edit comments once; I meant to have that quote there to help me reply, then I forgot to get rid of it twice, and I meant to change the link to https://postimg.org/image/eruqetcyf/a1baa953/ since that one didn't work. I'm also adding an extra medium gold mine per starting area. And as for the map's icon, RMS creator 2.0.1 beta doesn't support changing that, and the map description field doesn't work. Very thanks for update, that was really better! imagepath = "ui\ui map vinlandsaga 256x256"
imagepath = "ui\ring of fire 256x256"
the .tga icon file should be in your AoM textures\ui folder. mapinfo detailsText = "insert details here"
Hey Garn, please update your account with an actual email that we can use to contact you. "You are required to keep your forum account's email address up-to-date. If a warning sent to the email address on record bounces, your account will be banned and you will have to fill out an Unban Request Form to have your account unbanned"